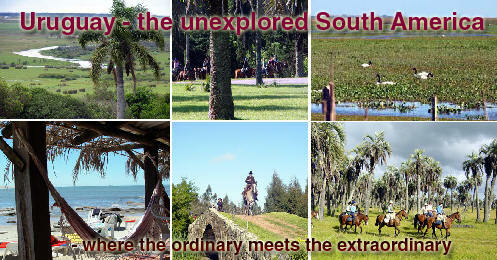 Uruguay offers top horse riding holidays through the land of the Gaucho. On our Hidden Trails Laguna Negra Estancias Ride you have the opportunity to see an abundance of colorful birds, canter across endless beaches, visit the rural communities, and experience a cultural and equestrian adventure perfect for nature lovers. A Uruguay horseback vacation offers the adventure traveler a virtually unexplored destination, jam packed with adventure tourism (but not tourists!) and ecological wonders. Uruguay is a virtually unexplored destination for adventure tourism in possibly the safest South American country. Our Laguna Negra Estancia Ride in this small and peaceful country offers nature lovers an amazing variety of ecosystems, mainly concentrated in the Bañados del Este Biosphere Reserve (UNESCO). The Bañados del Este Biosphere Reserve is unique place where within short distances exist wetlands, hills, native forest, palm groves, sandy and rocky beaches, rivers, coastal lagoons and savannahs, all filled with an enormous diversity of birds (more than 400 species) and other wildlife like the endangered capybara, pampas deer, sea turtle and franca whale among others, which coexist in harmony with the cattle, sheep and horses that populate the vast pampas. La Barra to Garzon Ride offers a scenic trip exploring natural reserves, forests, and beaches for riders of all levels. Situated on the undefined frontier between the Spanish and Portuguese empires, Uruguay has always been a region of passing influences, contributing to the hospitable character of its people. Conquerors and then large waves of European immigrants arriving during the first half of the last century, have enriched the native traditions, forging a very particular cultural identity different from the majority of Latin American countries. Indigenous remains, fortresses of the colonial period and traces of the gaucho's life have combined with a rich urban architectural heritage. Due to the diversity of natural landscapes and to the centennial tradition related to the Criollo horse, Uruguay is one of the most fascinating places to horseback ride. The weather in Uruguay is variable, but you can expect somewhat warm spring and autumn temperatures. The average temperature at this time of year is 65 F, average lows are 54 F, and average highs are 74 F.